(TibetanReview.net, Nov25, 2016) – China said Nov 22 that it had begun operating on Oct 31 a regular weekly rail freight service from Lanzhou in Gansu province to Kathmandu in Nepal. Currently, however, the railway line stops at Xigaze (Tibetan: Shigatse) in Tibet and the freight line then continues by trucks. However, a rail connection between Tibet and Nepal, which is still in the planning stage, could be up and running by the early 2020s, reported China’s official Global Times newspaper Nov 22. Despite the current logistical difficulties, the new freight route is still 35 days shorter than the sea route via Kolkata, India, the report pointed out. 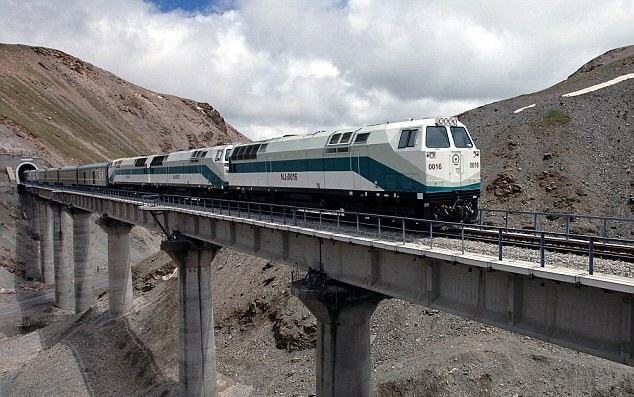 It added that the 10-day freight line massively accelerates transport between the Nepalese capital and Lanzhou. However, the new route is still apparently not economically viable. The report said, however, that there was a good chance, given the shorter time and distance of the overland route, that the railway line will eventually become economically viable. Meanwhile, with the Gyirong (Tibetan: Kyirong) mountain pass being open again, a railway could possibly be built without needing to tunnel through the Himalayas. The report added that a tunnel, if it was needed to be built, would be a mega-project which would be hugely expensive, technologically demanding and internationally controversial. With or without a tunnel, if the Tibet-Nepal railway is indeed constructed, the report said, it could mean a game-changing development for trade between East and South Asia and also increased interaction between China and India. It added that establishing a regular trade link with Nepal will be the first step towards building trust and increasing trade with India as well. The report noted, however, that India seemed to be as suspicious of China’s activity on the Nepalese border as it was of Chinese presence on its own frontiers elsewhere in the Himalayas. “It has reacted to China’s recent overtures about improving trade connectivity and infrastructure with a distinct lack of enthusiasm.” These were reported to include a Chinese proposal to build a Bangladesh-China-India-Myanmar trade corridor.